Uber is evolving. Since its launch in 2013, uberX in San Francisco has grown at an incredible rate, attracting thousands of new riders every month. We’re the largest ridesharing platform, but still only account for a small percentage of transportation in the Bay Area. Every day, tens of thousands of people still pile into buses, board trains or hop on the ferry for their morning commute. Others climb behind steering wheels and drive themselves to work. Despite Uber’s rapid growth, we’re just scratching the surface of the transportation market. So how do we take Uber to the next level? That’s where uberPOOL comes in. The idea is simple. With uberPOOL, riders who happen to be requesting a ride along a similar route will share the ride and split the cost. The beauty of uberPOOL is that it can both lower costs for riders and increase overall trips for drivers. Riders get a discount while drivers spend more time on trips and making money. Currently, drivers get paid while transporting a rider….but what if you could be paid on the way to picking up riders, too? uberPOOL fills that gap. On a normal uberX trip, you take your passenger to their destination and end the trip. Your next fare doesn’t start until another request comes through and you’ve picked up the new passenger. With uberPOOL, you’re picking up multiple riders and being paid along the way. You’re collecting a fare from the first pickup through the final dropoff, eliminating the unpaid period spent waiting for another request and traveling to another pickup location. It’s easy to sign up. Watch this video and we’ll let you know when you’re ready to start getting uberPOOL requests! Once you’re a part of the uberPOOL community, you won’t have to do anything — just login as you normally would and you’ll receive requests for both uberX and uberPOOL. We’re excited for this new chapter in Uber history! We believe uberPOOL will increase your earnings and open up Uber to an entirely new group of riders. uberPOOL is a new way to think about Uber, and we understand that you’ll have questions. Questions? Visit help.uber.com. Drivers are paid on trip distance and time plus a base fare according to their city’s uberPOOL rates. How far will I go out of the way to pick up someone else? uberPOOL matches riders going in the same direction. A rider requesting an uberPool understands that he or she may have to go a little out of the way, but we’ll make sure that it’s not too inconvenient for riders. How do you know that riders are going in the same direction? Riders are required to enter their destination when requesting an uberPOOL. We’ll only match up riders who are traveling along a similar route. How many riders are allowed at a time? 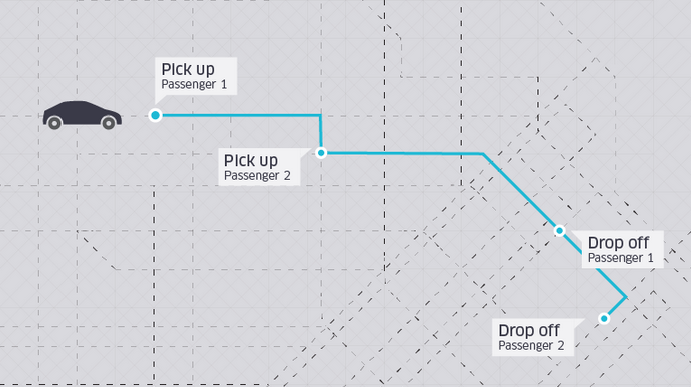 uberPOOL allows up to two riders per pickup location. If two riders are picked up together, they must also be dropped off together. We will communicate this policy to riders, but if more than two riders show up at a pickup point, kindly request that they cancel that trip and request an uberX. How will I know if I have two requests for an uberPOOL? Matching can occur anytime during the trip, as the above video shows. If you receive a second request after the trip has started, please accept the request and the Uber app will redirect you. What if a rider doesn’t show up? We’ll make sure that riders understand that when they request an uberPOOL, another pickup and a driver are now depending on them to show up on time. As a driver, we suggest that you wait one minute before calling the rider. If the rider still hasn’t showed up after another minute, cancel the trip and move on. Can riders change their destination? No, with uberPOOL dropoff locations are fixed. Riders are not allowed to change their destination after they have requested a ride. If a rider wants to change their destination, kindly request that they cancel and request another uberPOOL. Can I prearrange a trip with a rider? uberPOOL riders cannot prearrange a trip with you, since sometimes their best match may be with another drive-partner. If you have a repeat customer to whom you want to offer a ride, please make sure they request uberX. Which rider should I drop off first? The Uber Driver App will tell you the most efficient order for all rider pickups and dropoffs. 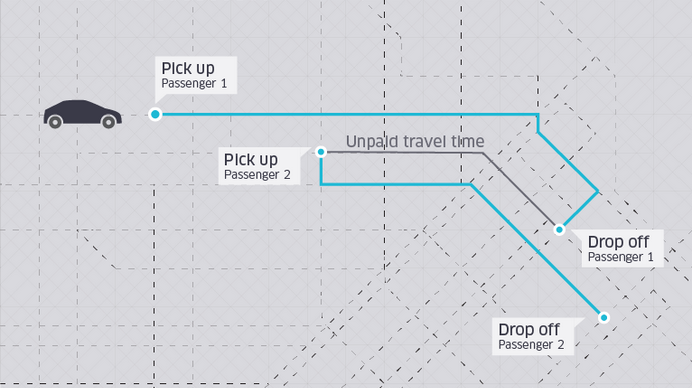 The uberX surge multiplier that is in effect at that time will apply to uberPOOL trips.